Head Over Heels For Teaching: Must Read Mentor Text: Snowflake Bentley and Pin It to Win It! Must Read Mentor Text: Snowflake Bentley and Pin It to Win It! Happy Sunday! I hope everyone enjoyed their break...back to school tomorrow! Linking up with my friends Amanda & Stacia for their Must Read Mentor Text to share a beautiful story: Snowflake Bentley. This picture book is such a beautifully illustrated story and perfect for this time of year! It's about a boy who is mesmerized by snowflakes. The book shows his progression from a child to adult and all of his failures/successes in between. Wilson Bentley loved snow and when he was finally able to see snowflakes under a microscope, he was determined to find a way to photograph them so he could share their beauty with everyone. The book also includes a real photograph and quote by Wilson Bentley at the end of the story, as well as a few of his snowflake photographs, making it authentic for readers. Although this story is categorized as a biography with its informational text, it has a plot and is written to intrigue readers of all ages. This book would be perfect to incorporate science and art too! There are so many learning opportunities for this book! One of the first things I will focus on is character analysis-using my "Characters Are a Gift" organizer. Snowflake Bentley shows such determination throughout his study of snowflakes and displays many other traits throughout the book that should be showcased for all to be inspired. Don't have a copy of the book? Here's a read aloud version on YouTube. Visit the official website of Snowflake Bentley (wealth of resources!). One of the fascinating things Bentley discovers in his studies is the uniqueness in each snowflake. This is would be a great time to discuss the uniqueness of students in your classroom-great for community building. Each student could create their own "unique" snowflake to be displayed around the room to create your own Winter Wonderland. The organizer above is from my newest creation. I designed a pack of Christmas Themed Reading Organizers to keep my students excited about reading during this holiday season. They can be used with ANY text and are Common Core aligned! Want to win the pack??!! PIN TO WIN! Pin any of the images, copy the URL, paste in comments! Super easy! Please make sure you leave your email address if you're not a blogger. Winner will be announced tomorrow! Don't forget about the BIG SALE tomorrow and Tuesday! Fill up your cart with goodies! 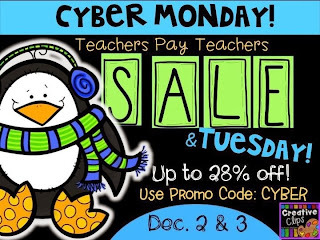 My store will be 20% off (except my bundles) plus 10% ﻿off from TPT-use code: CYBER. Oh my! Another book I just bought on Amazon! I've done a small, mini-lesson on snowflakes with my sixth graders for years and have used some of Bentley's photographs as a teaching aid. I didn't know there was a book about him! THANKS so much for sharing this title! How did you know that I wishlisted your new Christmas organizers product for TpT's Cyber sale coming up? Have a great day back-to-school tomorrow... I have one more day's vacation! Oh my - love it all. I do a snow theme in January and can not wait to use all of your ideas!! One of my favorite winter books! Perfect activity since my students just finished working on character descriptions. I love Snowflake Bentley and that website is a wealth of information! I love your idea about discussing the uniqueness of each of us as well. A perfect pairing!! What an interesting book! Thanks for sharing - I'm sure my students will enjoy the read aloud version!